There is nothing easier to make and better for you than a nice piece of roasted salmon. Seriously, it’s 15 minutes from fridge to table, and salmon is a power food (and the best kind to buy is wild Alaskan salmon, if you can find it). But as wonderful as it is, plain roasted salmon can be, well, plain. Which is where this recipe for salmon with rosemary balsamic sauce comes in. 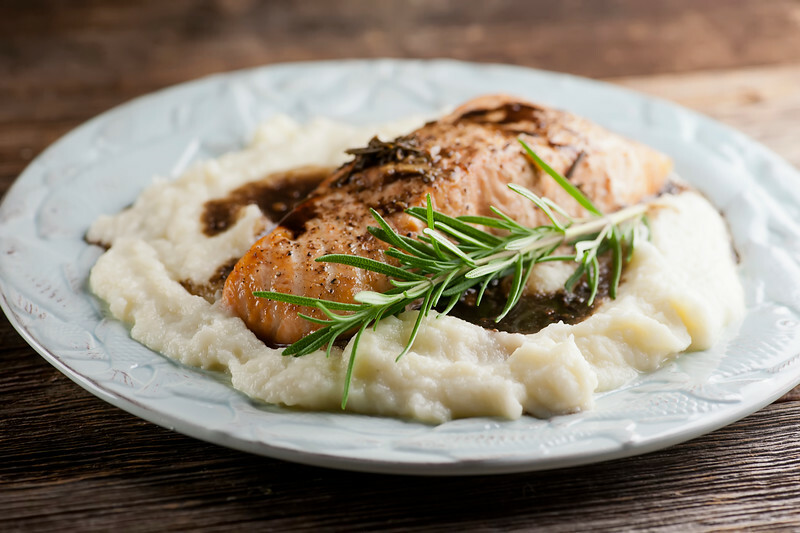 While your delicious, nutritious salmon is roasting away, you can be whipping up this incredibly flavorful sauce that will make your kitchen smell all kinds of wonderful and your salmon taste all kinds of good. Ready to jazz up your salmon supper? Let’s make it! In addition to a couple of lovely salmon filets, you are going to need some balsamic vinegar, a little mustard, some chicken broth and a nice handful of this. Beautiful, aromatic rosemary. I just planted my Summer 2016 barrel of rosemary outside my kitchen door, and I am here to tell you that there is nothing as cheery as a barrel full of sweet-smelling herbs. Just look at how happy they are! Back at the salmon dinner, you are going to put all those sauce ingredients into a little pot and simmer them gently while the salmon is roasting. When the salmon is done, supper is as easy as drizzling the sauce over the salmon and serving it up. You can put the salmon on a bed of mashed potatoes, polenta, baby spinach or whatever catches your fancy. 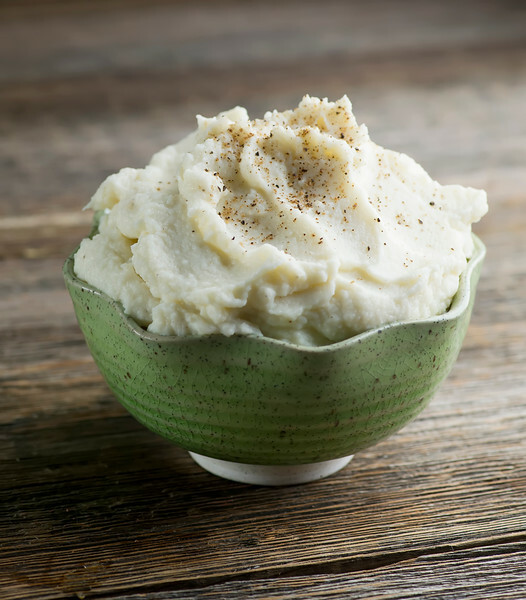 We were doing the Whole 30 when I was writing this recipe, and so I opted for a bed of whipped cauliflower. Whipped cauliflower is its own storm of wonderfulness. Just make sure you put the salmon on a bed of something, because you are going to want it to catch every drop of this scrumptious sauce. Just don’t tell anyone that this plate of elegance only took you 20 minutes – that is OUR secret! Preheat oven to 450 and line a baking sheet with foil. Place salmon filets on the baking sheet, drizzle with olive oil and season with a little salt and pepper. Bake for 15 minutes. While the salmon is baking, make the sauce: combine all sauce ingredients in a small pot and bring to a simmer. Simmer for 15 minutes. Serve salmon over a bed of rice, pasta or veggies, drizzled with the sauce. This salmon looks FANTASTIC, Kate! I could eat salmon multiple times a week though! 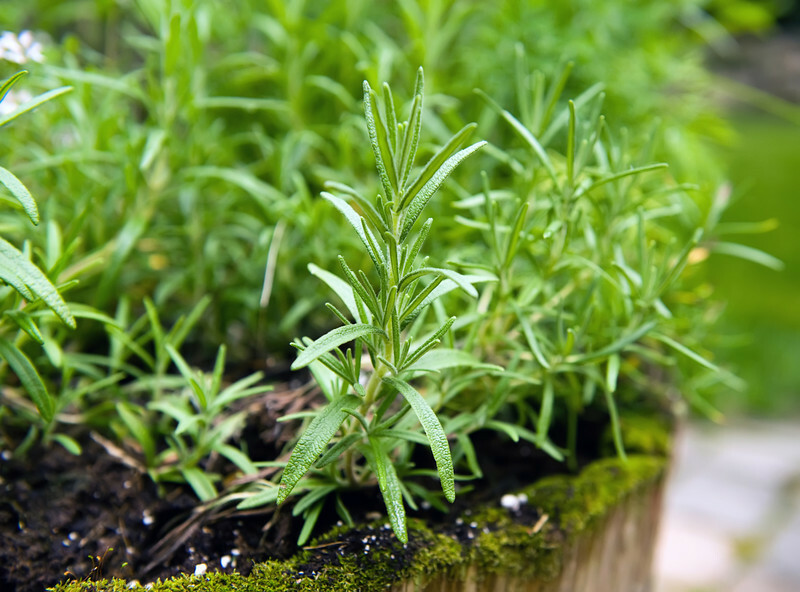 I have rosemary planted in pots on my porch as well and I love walking out and taking in that aroma! Thanks Robyn! And, I feel exactly the same way about my rosemary plants – mmmmmmmm! This looks so delicious Kate and so easy. I’m loving that sauce! Thanks for sharing! Have a great holiday weekend! you always make me want dinner right now! Fresh rosemary is always a good idea! It’s such a great herb to grow. You can’t beat that smell. I don’t think I’ve ever had it with salmon before. What a great meal! Love the smell of rosemary!